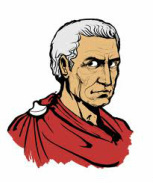 Welcome to the Julius Caesar Videos page. These videos will act as supplements, replacements, or enhancements to your readings of the play. Each video contents the full text, a cartoon/video enactment of the play, footnotes and study questions, and some of my personal commentary. These videos are best if watched full screen mode and will likely need to be paused and rewatched at times (especially for reading footnotes and commentary.) Focus on whatever you find most important (the text, the visuals, the footnotes) rather than trying to take in everything at once. Note: Videos are large (about 35 minutes) so they may take time to buffer. They work best with max volume or headphones.